The instagram + (plus) is the right app For android users who always wish to download videos and pictures directly from the instagram app without using any other third party app. The Instagram+ plus is the modded version of instagram for android. The app is created by OGMODS and it is packed with some cool features which can’t be found in the Original instagram, such as direct download of pictures and videos without any third party application, auto start videos with sound and many more. This apps are in two forms, the Instagram+ and the OG Insta+. The instagram plus is just the modded version of the original Instagram app, while the OGInstagram+ is for those who want to use more than one instagram account on a single device. 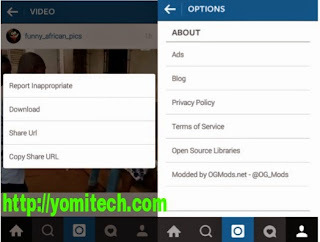 That means you can install both the Instagram+ and OG Instagram+ on a single device. Please, how do I link another Instagram account?